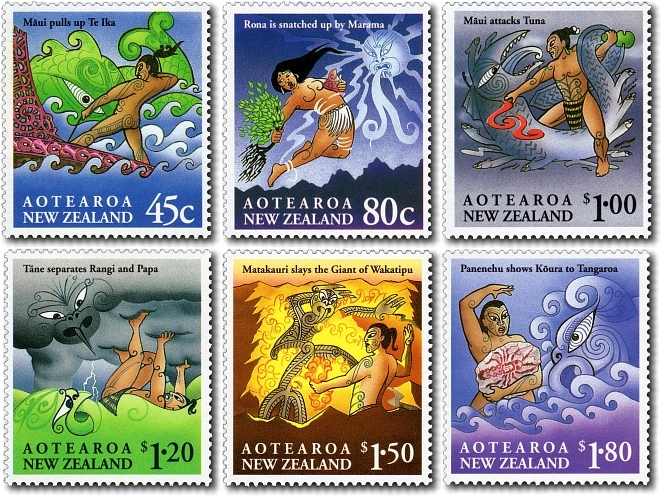 Six colourful stamps representing Maori myths of New Zealand. The Maori had no written language and thus their history and legends were passed on orally from generation to generation. Stories concerning the tribe and the world around them were carefully taught so they wouldn't be lost. Today they give us a valuable insight into the way Maori people viewed and personified the earth, sea and sky. 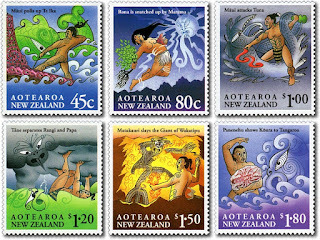 Being born in New Zealand I grew up with many of these stories but being a Pakaha (White European) I didn't have much contact with Maori mythology once I became an adult. 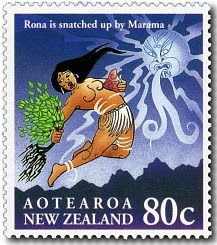 When I began this blog I soon discovered there were many stamp issues with Maori Mythology themes. Since then the richness and complexity of the Maori culture has become a source of fascination and intrigue. For an index to all our posts concerning New Zealand Maori. Another issue on Maori Mythology 2000 - Spirits and Guardians / Year Of The Dragon. 45c - Maui Pulls Up Te Ika. Using the jawbone of his grandmother as a fish hook, Maui is known as the mythical demigod who fished up many islands throughout Polynesia. 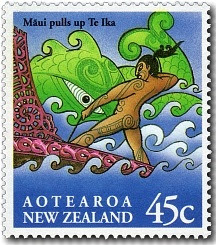 On one fishing voyage with his older brothers Maui casts his magic hook, a jawbone of his grandmother, and pulls up Te Ika-a-Māui (The Fish of Māui). Calling for help, he and his brothers strained to haul up what we know today as the North Island of New Zealand. His canoe is said to rest on Mt Hikurangi on the East Coast. Later versions of the legend say the South Island is his canoe and the anchor stone is Stewart Island. 80c - Rona Snatched By Marama (Moon). Today, if you look carefully, you will see the quick tempered Rona as a lonely figure in the moon - or so the sad legend goes. One night she took her calabashes to fill them with water. As cloud passed and darkened her moonlit path she tripped over the roots of a tree, and in her exasperation looked up and cursed the moon. Enraged, the moon descended to catch Rona and it drew her skywards. She desperately clutched the branch of a ngaio tree but the moon's might tore the tree and its roots up to the sky, along with Rona and her calabashes. There she remains in the face of the moon until this day. $1.00 - Maui Attacks Tuna (Eel). There was once an eel who lived high in the sky, near the sun. After a long hot dry spell without rain he decided to descend to earth and live in a river. One day Maui's wife, Hine-a-te-repo, was standing in the river with her children and the great eel knocked them over, splashing and swimming around, eventually eating both the children. This enraged Maui who set out to kill the eel. Using his magic he flooded the cunning eel out of the river and into a hole. Jumping into the hole, Maui chopped the eel's head off and threw it into the sea - hence we have eels in the sea today. The tail was thrown into the river to create river eels and the middle part of the eel twisted around a tree which we now see as vines in the forest. 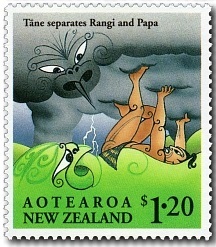 It is said that Rangi and Papa were once two halves of a single entity but the gods decided to separate them. Several of their many children tried and failed. Eventually Tane, the Forest God parted heaven from the earth and today Rangi and Papa grieve ceaselessly for each other - hence the rain, the dew and soft mists that rise from the earth. See our post - 2014 Matariki - Papatuanuku and Ranginui. 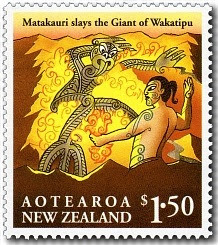 $1.50 - Matakauri Slays the Giant of Wakatipu. The beautiful Manata was tied by a special rope by a giant demon named Matua and the brave Matakauri was sent to rescue her. When his attempts failed, her tears softened the rope and she was freed. Hungry for revenge, Matakauri returned to light a fire near the sleeping Matua. By fanning the flames, Matua burned and the snow melted and poured over his ashes to form the lake we now know as Wakatipu. Occasionally the angry Matua growls in his sleep which causes the waters of the lake to bubble. 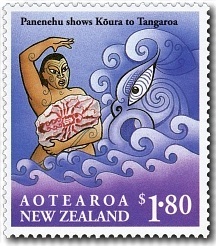 $1.80 - Panenehu Shows Koura (Crayfish) to Tangaroa. Panenehu, a Maori chief, missed the foods of his homeland - especially koura (crayfish). After praying he was sent a koura drawn on a rock. In his dreams he was told to take the drawing to the seashore and show it to Tangaroa, the sea god. In his rush to get to the shore , he dropped and smashed the rock but by using red clay he pieced it together. When the koura finally arrived they looked just like the broken image Panenehu had patched together. Today these ugly but delicious creatures can be found all around the New Zealand coast. These are nice stamps too Allan. I think I might have seen some on my mail. 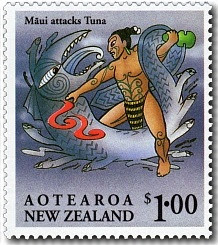 Maui seems to be popular, appearing on three stamps. This might be an area worth exploring Allan. now you have the stamps. Another amazing post Allan. You are really exploring Maori Mythology. I like the way NZ Post has presented this set. They are bright colourful stamps, each with a story to tell.